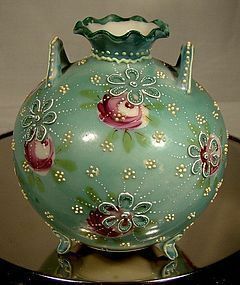 A Japanese Moriage green footed & handled porcelain vase circa 1880 with roses. This finely decorated pale green 4-1/2" high vase has a crimped neck, two handles, and three feet, and it features hand painted roses and leaves on a green ground. It is decorated with pale yellow and white jeweling and and pipework. It is unsigned as expected. This beautiful little vase is in excellent condition with no chips, cracks, losses, damage or repairs other than a small flake and scrape to the green ground near one rose and the loss of a couple of the yellow beads or jewels (barely noticeable). All items are thoroughly and conservatively graded and all condition issues are noted; all items are vintage or antique and may have slight signs of gentle use. Expedited tracked shipping to the U.S. starts at $20. Items paid with a credit card will be shipped to confirmed addresses only. We do ship internationally. All of our prices are in $US. PLEASE NOTE: we DO NOT accept PayPal, only VISA and MASTERCARD. © Fiona Kenny and www.fionakennyantiques.com. Unauthorized use and/or duplication of any part of this material without express and written permission from this site’s author and/or shop owner is strictly prohibited. 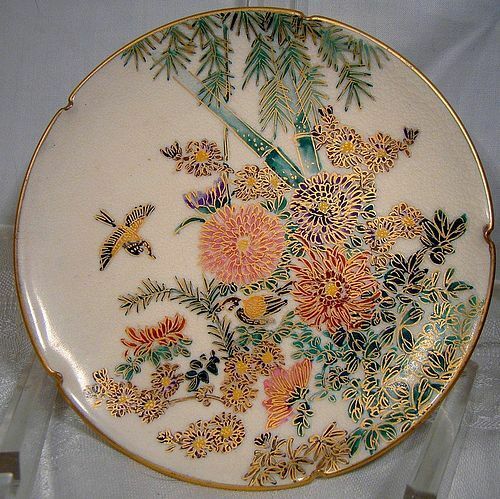 A Satsuma lobed plate with hand painted chrysanthemums bamboo and a pair of birds circa 1900. This antique small dish measures 5" across and has typical fine gold decoration over the work and a notched or lobed gold trimmed edge. It has a signature on the back, and it is in excellent condition with no chips, cracks, scrapes, losses, damage or repairs; it has some fine overall crazing, which is not unusual with Satsuma pottery. All items are thoroughly and conservatively graded and all condition issues are noted; all items are secondhand and may have slight signs of gentle use. Expedited tracked post starts at $19 (to the US - other spots may vary). Items paid by Visa or Mastercard are shipped to confirmed addresses only. We do ship internationally. All of our prices are in $US. PLEASE NOTE: We DO NOT accept Paypal. © Fiona Kenny and www.fionakennyantiques.com. Unauthorized use and/or duplication of any part of this material without express and written permission from this site’s author and/or shop owner is strictly prohibited.